Children can practise their handwriting and learn the weather words with three types of handwriting worksheet, starting with finger tracing worksheets for beginners, moving up to word tracing, and then finally onto our word handwriting worksheets. Pick a new worksheet depending on the weather that day! Our weather finger tracing pages are a fun way for children to practice their letter formation - this one is for the word "cloud". Start on the dot and then trace each letter in the direction of the arrow, using your child's forefinger. Kids can have a go at tracing the word 'cloud' until they feel confident enough to write it themselves on the bottom line. Practise your letter formation by tracing out the word cloud on our worksheet. Children can trace the letters with a finger to get a feel of the shape on our hail finger tracing worksheet. 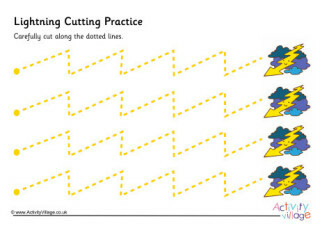 If they fancy more of a challenge they can try tracing with a pencil, trying to stay within the lines. Learn about the weather and practise handwriting too with this fun handwriting worksheet for the word 'hail'. Get the kids to do a bit of writing practise by tracing over the letters of the word "hail" on this simple worksheet. Younger children can practise the letters in the word "hot" with the help of the sun! You could laminate this worksheet to use with a dry wipe pen in the classroom. Children can practise writing the letters in the word "hot" and then try writing the word on their own on the final line. Young children will have fun learning the shapes of letters with this word tracing page for the word 'hot'. Younger children can practice their letter formation by tracing over the letters of the word "lightning". There's a lot of lightning strikes on this handwriting worksheet! Can the children trace the word 'lightning' then write it unaided on the last line? They say that lightning doesn't strike twice, but there are two bolts of lightning on this fun word tracing worksheet! Can the children trace the word underneath? You could laminate our shower finger tracing page and after tracing the letters with a finger use a dry wipe marker pen to trace between the lines. Our rainbow handwriting worksheet is a fun way to introduce writing to young children. There are three guided fonts to follow, getting steadily harder, and then space for them to write the word unguided. The pretty rainbow pictures should help encourage them! Trace over the letters of "rainbow" with this simple worksheet for younger children. Why not laminate and use dry wipe markers for repeated use? Children can learn to write the word shower, first by tracing the letters with their finger, and then with a pencil. Can the children trace over the letters in the word storm, which sits beneath a picture of a storm cloud? The picture of the bright shining sun is bound to encourage younger children to practise their letter formation on this sunny finger tracing worksheet. They simply need to trace over the letters in the word, then colour in the picture. We all love a nice sunny day, and the children can practise writing the word 'sunny' with our fun handwriting worksheet. Start children off with our "thunder" finger tracing worksheet - great if you're learning all about different types of weather. Learn to write the word thunder using the tracing lines on this worksheet, starting on the dot! Here's a fun way to teach your children their letters! Trace the word "wind" with a finger first, then a pen, starting at the dots and following the arrows. Practise writing the word wind! This lovely worksheet will encourage children to learn to form the letters correctly and then have a go on their own on the last line. Practise writing the letters in the word wind with this fun tracing worksheet.